Mother’s Day is one of the biggest holidays of the year and it’s a time when retailers and mothers alike all rejoice. Mother’s Day is an important day because moms play a major role in everyone’s life – they are mentors, sources of support, and givers of unconditional love. They sacrifice so much and provide so selfishly for their families, and every year, retailers are flooded with shoppers in search of cards, flowers, and new ways to express their love. It can be said that we are all looking for the next best thing to give as a gift – the one gift that will top the last. We recently stumbled across a blog post by Twitter made last year around Mother’s Day. The post featured tweets from celebrities such as Mindy Kaling, Justin Bieber, and Neil Patrick Harris in time for Mother’s Day with messages of thanks towards their mothers. This got us thinking because Mother’s Day is usually about flowers and cards – pretty much, a message of appreciation and love. Although words of thanks through texting, calling, and those cards may last for time to come, wouldn’t it be nice to have that message remembered and engraved forever (literally)? If you’re looking a way to send a message of thanks that will last the test of time, consider something other than a just a phone call, paper card, or phone call. 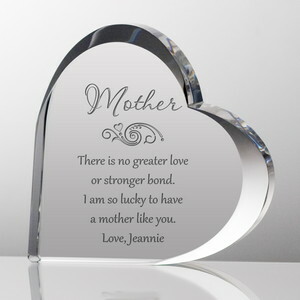 Engrave your heartfelt message into Mom’s heart with our impressive selection of personalized keepsake plaques, which come in crystal and glass finishes. 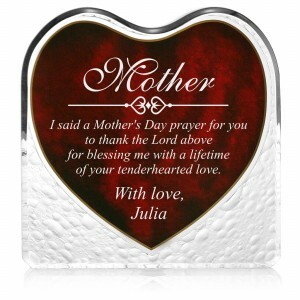 These plaques will gleam proudly from Mom’s office desk, dressing table, or bedside table, radiating your warmth. These items will make for a creative and loving way for Mom to remember your sentiments and thanks towards her for her duty as a mom, and will definitely make for a memorable Mother’s Day gift. From all of us at MemorableGifts.com, here’s to a Happy Mother’s Day to all the hard-working and warm-loving mothers out there!